Purpose: To teach warehouse managers and risk managers the fire protection needs of automated warehouses. 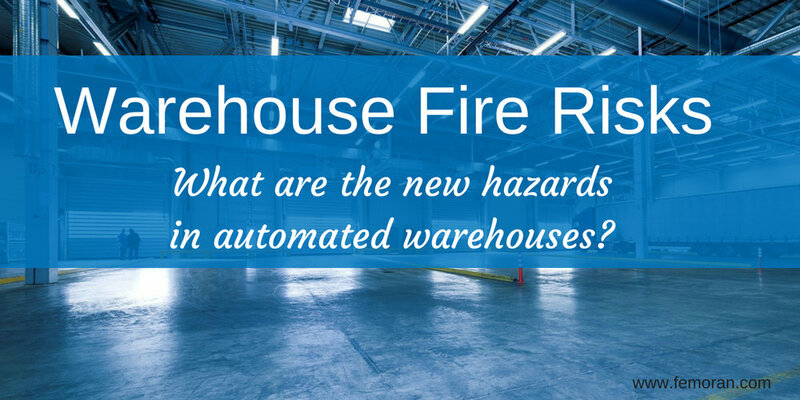 New fire risks in automated warehouses. Fire protection design flaws with new automatic storage retrieval system (ASRS) designs. FM Global's 5-year study and fire protection recommendations. Robots are going to take your job. Robots are probably not going to take your job, but they are taking an active role in warehouses. Automated warehouses, or automatic storage retrieval system (ASRS) warehouses are becoming more and more common. Below is a video of Meijer's warehouse automation. It simplifies warehouses as a whole. Less downtime. Less cost. Less error. However, automated warehouses bring on additional fire risks. What are the fire risks of automatic storage retrieval systems (ASRS)? While robots make warehouses more efficient, they bring on new fire risks. See that robot arm above in the video? The cable making it work can fray and spark. Those sparks can land in an open container and start products on fire. Fire sprinklers, if not designed for automated warehouses, will go off, but the water will collect inside the open containers in the racks instead of reaching the fire. That is a problem, isn't it? Combustible materials being stored in the warehouse. Possible external hazards such as transformers, flammable liquid, and petroleum. What fire protection is needed in an automated warehouse? NFPA 13 is the go-to resource for the standard for the installation of sprinkler systems. However, NFPA 13 has not weighed in on guidelines for automated warehouses yet. However, FM Global has. They spent millions of dollars and five years to study fire protection needs in automated warehouses. FM Global's testing included large-scale fire tests, computer simulations, and 200 water flow tests. After five years of studying automated warehouse fire protection needs, they have compiled a list of recommendations. Automated warehouses are at an extra risk for fire. Why? Because their goods are stored mostly in open, plastic storage bins, which burn more severely than cardboard or wood containers. Another issue is the rack design. The design of the racks divert fire sprinkler water from the containers (which is the most likely spot for a fire). While the racks and open containers optimize space, they also make fire protection more difficult. FM Global has created the report Protection for Automatic Storage and Retrieval Systems. It was developed to help warehouse managers and risk managers determine how to protect their asset and mitigate fire, water, and smoke damage in the event of a fire. Their report determined IRAS protection schemes that contain fire to its module is the best solution. These systems are modular, and keep the fire contained to its section. FM Global's Staff Vice President said, "Our testing demonstrated that our approach creates an in-rack sprinkler arrangement that stops a fire dead in its tracks by the in-rack sprinklers located closest to the fire. This approach eliminates the chance of fire spreading too far vertically through the rack and triggering additional sprinklers at upper levels in the rack or at the ceiling." Essentially, this design reduces damage and cost. FM Global has done the work and determined the best way to protect automated warehouses. IRAS protection schemes satisfy the issue of open storage and racks hindering standard fire sprinkler designs. Are you ready for the future of warehouses?